And that’s the end of Issue No. 7! Good thing everything is all going exactly as planned. Everything is fine, just fine! Right? It must be time for a cover poll — but first, an update on the State of the Comic. Where are my Print Editions?? If you’re one of the folks who has gotten paper copies of Issues 1-4, you might be wondering why you don’t have Issues 5 and 6 in hand, given that we just saw the end of Issue 7. Here’s the thing. There’s a difference in how computers and printed materials handle color (additive vs. subtractive, yadda yadda yadda). Long story short, my sample copy of Issue No. 6 had a number of color problems, chief among them many panels that were too dark, and also some color problems on some purple flame. That means I need to go back and try to rework some colors and lighten up approximatley 50% the issue. Which is going to take some time! So, I try to stay about an issue ahead of where things are posted. When I started posting two years ago that actually worked out pretty well. What I’m finding now is that I’m doing more with my art–on the drawing and coloring stages–that it’s becoming harder to keep up. Right now I’ve got a page or two left to draw and half an issue to finish coloring. Things were a lot easier when every panel was just inside a featureless hallway. Now I have backgrounds, and I’m shading with blacks, and so on and so forth. 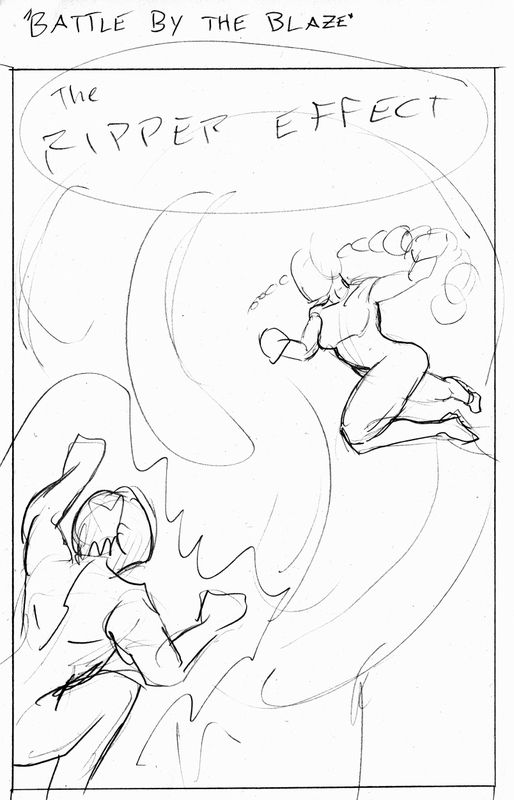 Normally on a weekend I could churn out two pages pencilled and inked, easy. Now I’m finding that if I schedule weekend activities, that’s getting harder to actually accomplish! I tend to alternate between trying to learn new things and trying to learn how to do when it faster. Time to start working on the latter again. Anyway, I’ve got a coloring backlog, an issue that needs some re-working to be ready for print, and on top of that, I need to take my page full of sticky notes that is Issue No. 9, build it into a script, and make some thumbnails. It’s going to be huge. Probably 30+ pages long. All this is to say that we’re going to take a short break from posting after this cover is done. Maybe two weeks? I’ll keep you all posted on where I’m at. And we’ll probably take a similar break when Issue 8 finishes posting. 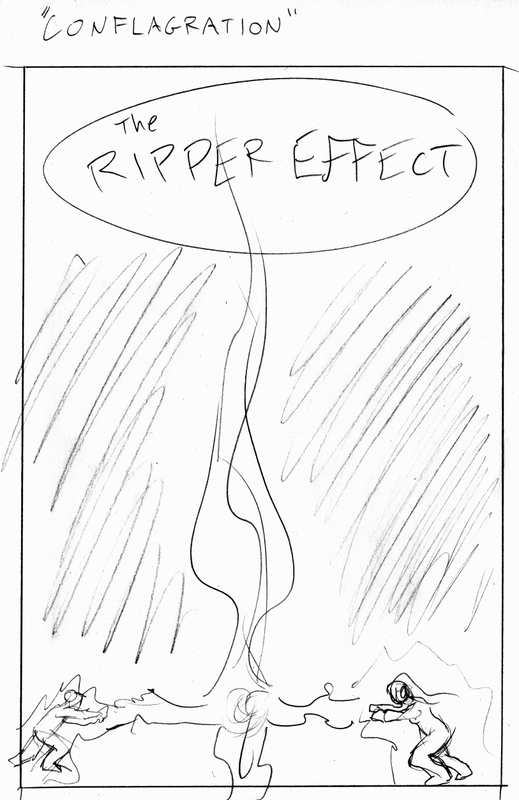 There are three possible ends in my mind for The Ripper Effect. One of these is at the end of Issue 9. Another is Issue 10. And the last is somewhere in the distant future — probably Issue 16 or so. Which one I end up going with really depends on how Issue 9 goes, who survives, etc. (As I mentioned above, I haven’t written Issue 9 yet). Theoretically this could go on forever. But if it does go past Issue 10, we’re definitely going on a bit of a hiatus because I will be redesigning the costumes for pretty much any character who survives Issue 9. I mean, I guess it’s possible everybody will survive. Issue No. 7 Cover Poll! I tried out a number of ideas but only came up with two that I think will actually work this time around. First up, I give you Conflagration! Basically, we have Blue and Purple facing off, blasting their colored fire at each other, on a black background. That last part is hard to communicate in a sketch. Anyway, purple fire from one side, blue fire from the other, and it meets in a burst of white at the center that shoots up the whole page. Next, we have Battle by the Blaze! This one has Rosary flying in from the right, and Purple flying in from the bottom left. Rosary is so gonna punch that dude. The big fireball is in the background.